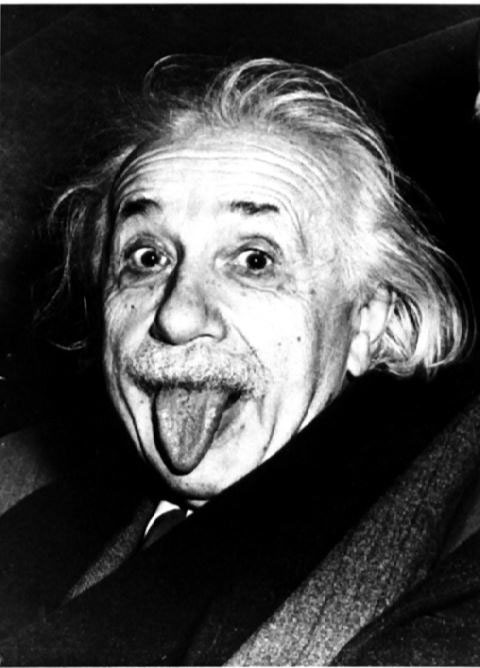 Albert Einstein was born in à Ulm (Germany) on March 14, 1879, during the german unification, and was average at school. In 1895, he refused the military discipline of the german high schools and he joined his parents in Italy. Refusing the military service, he prepared the entrance examination of the Polytechnic School of Zurich. He succeeded the second time, at the age of 17. Then, he met Mileva Maric, who was student in mathematics and physics, and who became his first wife in 1903. They had three children (Lieserl before the got married, Hans-Albert in 1904 and Eduard in 1910). After he got his diploma (in 1900), he couldn't teach because he was too independent. He had to be satisfied with a job in the patent-office of Berne. At this time, the physics is in crisis : we can't reconcile the mechanics (which says that every move is relative to a reference frame, according to Galileo's rules) and the electromagntism (which introduces the concept of a motionless « ether » according to Maxwell). So, the genius of Einstein began to express itself. In March 1905, he succeeded to join together the two thories and explained how the heat can be transformed in light. In May, he wrote that the ether didn't exist. According to him, the matter and the light undergo the same effect of relativity, but simultaneously. So, the speed of light seems to be constant : the theory of relativity was born. These two articles, published in the great review Annalen der Physik, were supplemented in September by a postscript which announced the famous formula : E = mc2. Einstein wanted to go further but was blocked by his lack of mathematical knowledge. He then left the patent-office for a job at the university of Bern then of Prague (1911). One year later, he teached at the Polytechnic School of Zurich where it finds Grossmann, an old friend of school. He enters in 1913 to the Academy of Science of Prussia. He finally obtained the necessary knowledge and stated in 1915 the theory of general relativity, which describes the fall of the bodies. According to this theory, the gravitation would be due to a deformation of the space-time. But that remained to be checked. Einstein then predicted, thanks to his theory, that the rays of a star located behind the Sun must be deviated, and he calculated this deviation. Thanks to an eclipse, Arthur Eddington confirmed in experiments this forecast on May 29, 1919, but the year was obscured by Einstein's divorce. He got married with Elsa Löwenthal. Thanks to this confirmation, Einstein became famous. He profited of this to spread his political ideas. In 1921, he won in the United States some money to create an university in Palestine. But, when he came back in Germany in 1933, Hitler got the power. Born in a jewish family, Einstein flew in Princeton where he met Gödel. He obtained in 1940 the american nationality. Then, he convinced the president Roosevelt to develop the nuclear program before the nazis. But, when he saw the result in 1945, he regretted and militated with the emergency committee of the atomic scientists to limit the power of the government in the scientific research. Unfortunately, his genius was wrong at the end of his life : his theories have guided other scientists like Bohr to the quantum mechanics, which he paradoxically refused. This obstinacy has followed him until his death on April 18, 1955 in Princeton. His children also had tragic destinies : Lieserl, who was an illegitimate daughter, was gave up and nobody knows what happened to her. Hans-Albert, who was schizophrenic, lived in hospitals. The history will remember of Einstein as a more than talented (he obtained the Nobel price in 1922) and politically engaged (he chaired in 1928 the League of Human Rights) scientist. Between the two wars, he gave with Arthur Eddington a pacific image of science : far away from the old resentments, an english astronomer gave reason to a german researcher.